It’s almost labor day and we all seem to work so hard originating. Some days we are busy taking apps and closing loans. Other days we are working extra hard to bring in new loans and make some good relationships. WHY shouldn’t we CONTROL the buyers ??? Sorry- but that is the truth and there’s no way to sugercoat it. But if you can give a realtor pre-approved buyers- they suddenly become very loyal- interesting huh? You send a post card to renters who you know are paying a rent comparable to the loan size you are looking for. PRETTY COOL – HUH? BUT MOST IMPORTANTLY — IT WORKS!!! Ever feel like you are banging your head against the wall and not making any progress? Well if you have been an originator for more than 1 week than you probably already know this feeling all too well. Our business is challenging with many ups and downs but I am sure you already know that. You work hard to get a meeting with an agent. If you are successful you go to the meeting and tell them all about the great rates you have and your programs. They tell you that they are either a listing agent to get rid of you or that they are forced to give out 3 names. Some will tell you the truth which is that they already have a favorite lender or that their company has an in-house lender that they are “forced” to use. The truth is that the in-house lender statistically only does 27% of the business in that office. What can be more common is that they are simply very nice to you and just never ever return your calls or call you with new business. It’s very frustrating to work so hard to get the appointment, leave it feeling it went well, and then never getting any calls from that person. HOW DO YOU CHANGE THIS ONCE AND FOR ALL? There are 3 important sentences that will change this dynamic for you once and for all. Ready? The question becomes which niche right? There is a niche right now that has 7.3 million buyers in it that are anxious to buy, ready to buy, and very few originators ever market to. That is the niche of boomerang buyers that had an issue during and post meltdown. 2018 thru 2020 are predicted to be the largest volume years for these buyers which is why we are seeing so many NON QM lenders coming into the market with programs for them. THINK ABOUT WHAT THAT MEANS FOR YOUR BUSINESS? Now you can also go into any real-estate office and do the same regardless of their in-house lenders. Imagine that! You can now also get some FREE PUBLICITY for yourself since you have an area of expertise that few others are speaking about. This gives you the opportunity to contact your local media with an important topic that is new and different. See the hard truth is we all have very similar rates and pricing. But very few of us every differentiate ourselves enough from the competition by being the expert in a niche. I realize we are all bombarded with tools and tricks that people – who don’t even originate – are offering us to grow our business. Right now many are vulnerable because business has slowed down for many of us. Let’s just take a minute and visit a scenario – really clear your brain for a minute. First- you don’t have to beg for business because there is a way to actually get agents and borrowers to chase you. It’s not going to be because you have a great script or any other of the new fangled bull dookey that you are being told. Did you like that word – bull dookey? 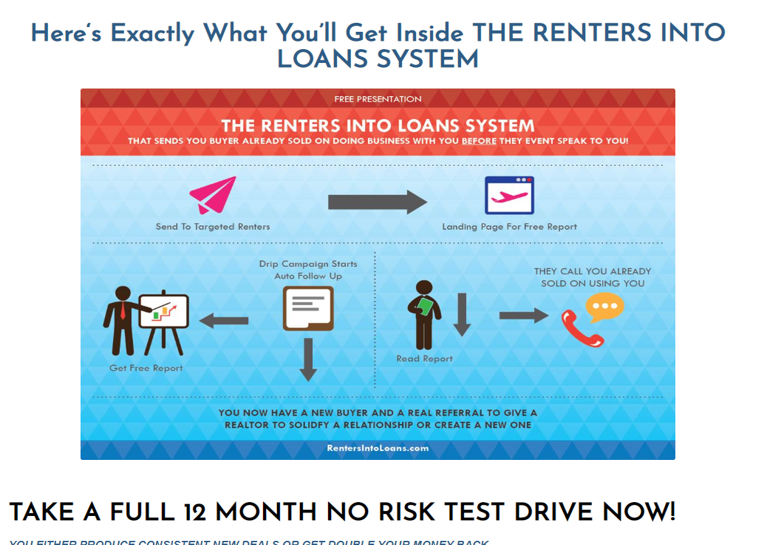 It’s simple – you will have the one thing they want and that is because you are able to help borrowers that many other lenders and originators can not help or simply won’t help. You can walk into a national builder today that has their own in house lender and offer this and they will listen and actually call you. You can walk into a big broker office that has one or even 2 in-house lenders and offer this and they too will listen. YET THERE ARE 7.3 MILLION OF them and they are easy to find and are eager to speak to you. I will be doing a training on this topic this Thursday August 23rd from 3-4 and I hope you can make it. There will NOT be a replay of this training so whatever you have going on you might want to rearrange it if you can see the value in what I am sharing with you. Not sure? that’s fine because I know your time is valuable so I have come up with a way to make sure you have not wasted your time. Get on the training and if at the end you have not discovered 1 new BIG IDEA just send me an e-mail to brian@toporiginatorsecrets.com and I will send 25.00 in your name to the charity of your choice.